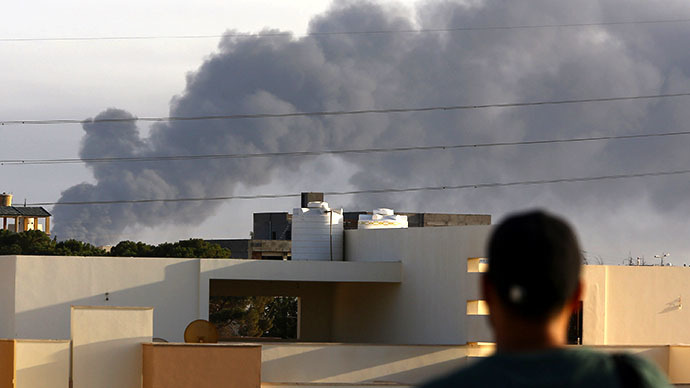 Over 50 Libyan fighters died in exchanges over Tripoli's airport during the weekend in one of the worst outbreaks of violence since Gaddafi's ouster. With state authority on the verge of collapse, France and Britain have ordered citizens to evacuate. One hundred people have died in the battle for the airport, with 400 others believed to be wounded, the country's health ministry announced. 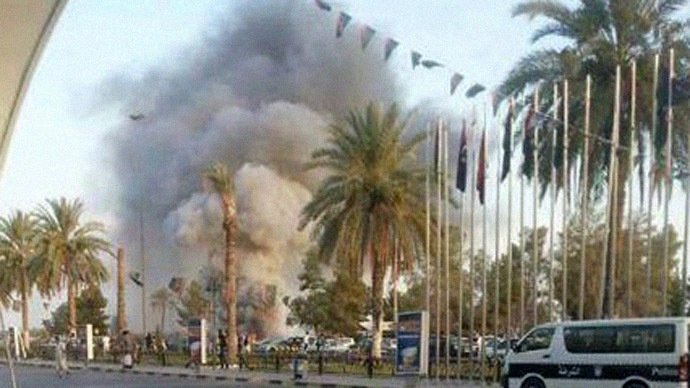 Over the past two weeks, radical Islamist militias have tried to wrest control of the airport from the Zintan militia, which made its name during battles against former Libyan leader Muammar Gaddafi three years ago, and has controlled the country’s international gateway since. 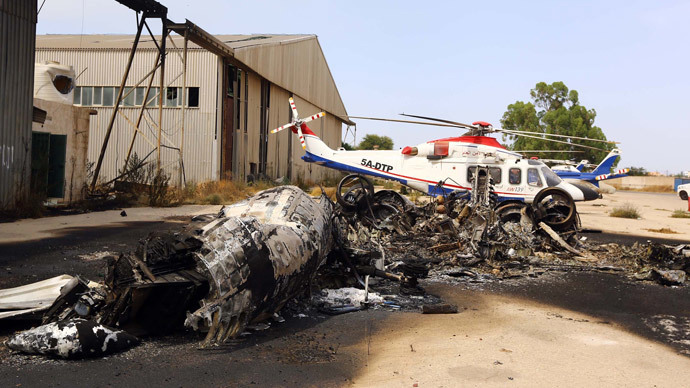 Airplanes worth hundreds of millions of dollars have been destroyed in the shelling. The crossfire led to additional casualties on Saturday. 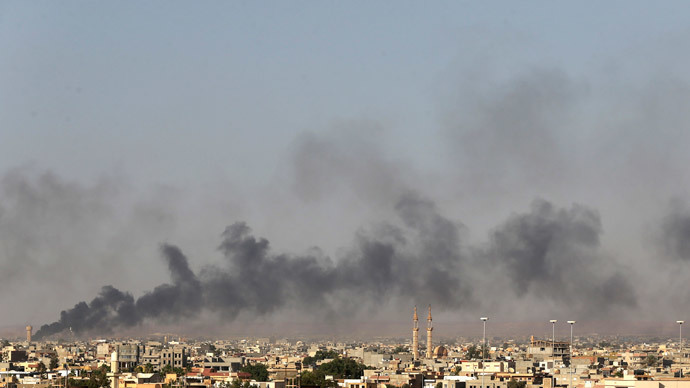 “There are 23 people dead after a Grad rocket fell on a house in Tripoli. Some of them are Egyptians, but we don't know how many,” Egyptian Foreign Ministry spokesman Badr Abdelatty said. On Friday, the government – which relies on a disparate coalition of loose allies to maintain any semblance of control – warned that the country is on the verge of political collapse. The UK has evacuated all “non-core” members of its diplomatic mission, who fell victim to an attempted carjacking on Sunday when they came upon a militia checkpoint. Pictures later appeared online, showing bullet marks on the convoy of diplomatic cars. “Shots were fired at our vehicles but they managed to drive on and leave the area,” said mission spokesman Bob Phillipson. "All embassy personnel are safe and accounted for and there were no injuries. In light of travel restrictions in and around Tripoli, we are reducing the number of staff at the embassy but we don't comment on the details of staff security. The embassy remains open for core business." France has strictly instructed its citizens – many of whom may be in Libya working on oil and economic regeneration projects – to leave the country by all means possible. The United Nations mission departed the country a fortnight ago. Earlier this week, a statement by the UN Security Council condemned the violence as “unacceptable” and called for all parties to open a “political dialogue” based on the results of June’s parliamentary election.